CO. H. 6th INF (Infantry) - 5 c - Pool. Used as a token for billiards in the recreation room. Not in the Moneta Museum. Plate token in P. Spooner's "Arizona Trade Tokens - 2010"; R10 (1 to 2 known). 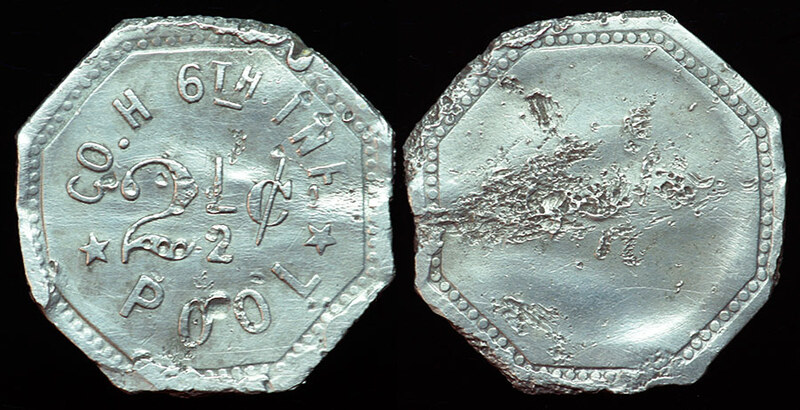 This token is better attributed to Camp Little (Santa Cruz county) Arizona, where a similar token is attributed in Peter Spooner's "Arizona Trade Tokens - 2010"